Select one or more filter categories. While STEM is typically thought of as a male-dominated industry, a local community group is trying to change those perceptions, by running a series of coding workshops for girls in grades 4-12. 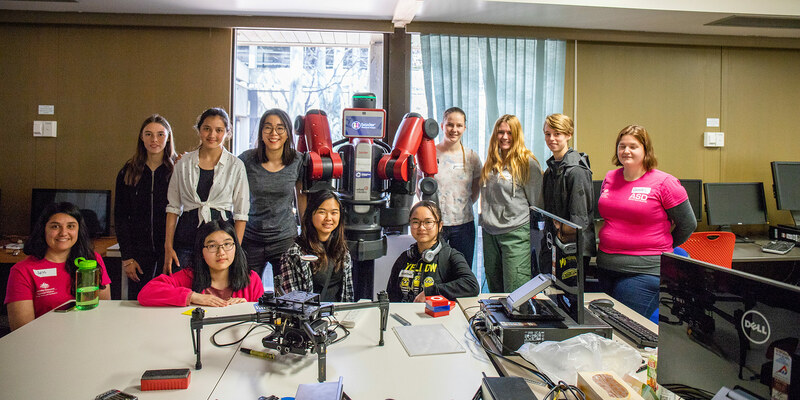 In collaboration with the University of Canberra, the Canberra Girls’ Programming Network (GPN) hopes to create additional pathways for girls to kick-start their careers in IT. GPN run quarterly workshops with volunteer tutors from UC and government agencies to give young girls the confidence, tools and knowledge to enter and flourish in the world of coding. In addition to the hands-on skills that they learn, the workshops give girls exposure to female role models across academia, government and industry. Courtney Ross, the Program Leader for Canberra GPN and a Security Practitioner at the Australian Cyber Security Centre, said the core aim of the program is to help facilitate pathways into IT and encourage girls to get involved. "Hopefully in ten years’ time, programs like this won’t need to exist. It’s important to show how prevalent IT actually is, and to show women in these kinds of roles – not just the super amazing women who balance a whole range of enormous tasks but also everyday people who show that this is achievable," she said. According to Courtney, the volunteers who facilitate the workshops are fundamental to the program’s success. "I find it amazing how many volunteers show up to these kinds of things. It really shows how much people want girls to succeed," she said. Caitlin Macleod, a cyber-security engineer for the Department of Defence, is one of the regular volunteers at the GPN workshops. She describes the workshops as a way to sustain her passion for IT while making valuable contributions to young girls’ lives. "I come back every time," she said. These events are really important because they mix people from different industries and also show young people – young women, in particular – how we can exist in these industries and grow into them. For the girls who go along to the GPN workshops, there are endless opportunities waiting for them. One particular attendee described the workshop as something that sparked a passion in her for IT and computing. "After my one-day workshop, it [programming] seemed like something I could get a lot of enjoyment out of. Now two years later, I have topped IT at college and want to do computer science at uni," she said. "I would have never even considered it if it hadn’t been for GPN and I would have no idea what I’d be doing next." It’s a similar story for Ranisha Agasti, a student in attendance at the University of Canberra workshop on the 21st of October, who went along to learn more about what her parents do for work. Her mother, Pamita Muta works as a developer for the Department of Social Services and believes that understanding IT is vital to a range of careers, not just those in STEM. "It’s a fantastic opportunity for the girls to be introduced to the STEM program and get at least a minimum knowledge of IT and programming. Whichever field you choose to work in, you have to gain knowledge about computers," Pamita said. "They’re so lucky to have this opportunity." Ranisha said that her favourite part of the workshop was getting to work with and meet other people – something that Courtney says is a key aim of the workshops. "The goal is to get girls out to a workshop for a day. They get to spend the day programming. The point is that they come along for the day, they have fun and they hopefully make friends." In part, this is because Ms Ross believes that having people who are passionate can spark passions in other people. "I had such a passionate teacher in IT that it made a huge difference and made me realise that’s what I wanted to do," she explained. "That’s why I want to be involved in this kind of thing. My teacher didn’t have all the answers but he created a space where we could fail, try things and learn. That’s really what I want to create in this space here for girls to come and get involved." CCAE alumna Peter Gately needs your sails! Founder of Sails Ocean Sails (S.O.S. ), Peter has travelled the world to teach at maritime schools and donate sails to solve a little known problem. The University of Canberra’s international poetry festival, Poetry on the Move, is turning Canberra into a world centre of poetry while showcasing the ongoing research at UC’s International Poetry Studies Institute. Dr Cathy Hope’s Streetwise Project gathered 35 seniors and turned them into graffiti artists, in a bid to challenge ageism and bust stereotypes. Nestled in the middle of the University of Canberra Bruce campus, Wiradjuri Preschool and Child Care is home to some of the youngest members of the UC family.